National Shrinkwrap - It's a Big World, We'll Help You Shrink It! It's a Big World, We'll Help You Shrink It! On this site, you'll find a wealth of information on shrink wrapping your products....especially if you're wrapping DVD's, CD's, soaps, cookies and other small items, or if you plan on Gift Basketing. Pawn Shops! Wrap your video games on intake...no more lost cords, manuals and parts! There are videos on how to wrap Gift Baskets and videos that show how to wrap soap efficiently...all demos that don't require downloads. There are also discussions of film and equipment, designed to help you make the right choices to maximize your output, and minimize your costs and efforts. In any case, we guarantee you can't find a more productive, cost-effective system anywhere near this price range. Even if you don't purchase your system here, you can learn about the types of machinery and film available to you, and pick up some valuable production techniques as well. Please feel free to call 1-800-423-7971 with any questions. We're here to help. If you'd like to jump right to videos that show exactly how our system works, please click here. At National Shrinkwrap, we DO NOT import our shrinkwrap systems from overseas, slap our name on them and sell them as our own. We custom manufacture and assemble each and every one of our systems. (click on image at left to go right to ordering info). Our systems are designed to last forever (your mileage may vary!) and deliver maximum performance in a manual system...at a fair and reasonable price. We give free service and technical support to current customers and offer numerous inexpensive upgrade options for those of our customers whose needs evolve. 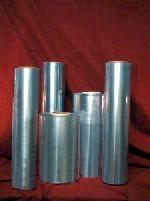 We also sell a variety of film for your shrinkwrap systems, such as films that allow scent to pass through and films that allow your products to "breathe". Our return policy is clear and simple...30 day money-back guarantee on virtually everything...and our freight policy is to charge just what the freight costs....shipping is NOT a revenue stream. Your two-year warranty includes parts, service and return shipping, if necessary. Any film purchase within 2 years of original purchase date, renews your warranty for another 2 years from that date. Free Labels for "Shelf-Talkers" and other signage with each roll! The Holy Grail of shrinkwrapping has been a biodegradeable shrinkfilm. We are very pleased to announce the availablity of BIOLEFIN 2.0...a food-grade, acid-free, oxo-biodegradeable shrink film with all the properties of our most popular film for wrapping soaps, candles, books, paper products, artwork and almost any other product. USFDA approved for direct food contact, this is the perfect packaging option for your natural and organic cookies, pies, pastries and other baked goods. Biolefin film shrinks ultra clear, and is currently available in 14 and 18 inch widths, perforated or not, and allows the scent of your product to permeate the film, all the while offering the puncture resistance, clarity and strength you expect...while addressing the environmental concerns of you and your customers. Biolefin is currently available for online-ordering and MAY BE INCLUDED IN WITH ANY NEW SYSTEM for an upcharge.Click here for a data sheet with more details about this revolutionary product. Biolefin;Protecting your product, your customers, your world. We also offer a complete line of impulse sealers starting at only 39.95. Hand models, table models and floor models with foot pedals.